NAGA CITY—Incumbent Tigaon, Camarines Sur mayor Arnulf Bryan “Arnie” Fuentebella is providing a meaningful alternative to the administration of Camarines Sur Gov. Migz Villafuerte. TOP: (L-R) Atty. 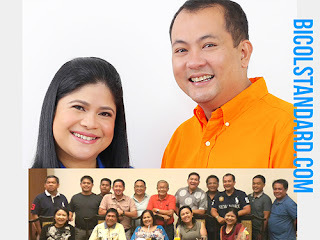 Peachy Alfelor-Moraleda and Mayor Arnie Fuentebella. BOTTOM: Leaders from the 1st and 2nd Districts of Camarines Sur, headed by 1st District Rep. Nonoy Andaya in a recent gathering in Manila vow strong support for the Fuentebella-Alfelor tandem. The young Fuentebella is the son of former Speaker Arnulfo “Noli” Fuentebella and Sagnay Mayor Evelyn Buquid Fuentebella. He is also the brother of Camarines Sur 4th Congressional District Rep. Felix William “Wimpy” Fuentebella. As mayor of Tigaon, he is known for establishing Tigaon Infirmary as a 24/7 hospital that responds to emergencies and provides curative health care, improving tax collections by more than 300%, increasing Tigaon’s gross income, and setting up a reliable, computerized database of the town’s socio-economic profile. He also oversaw the 100% energization of Tigaon’s barangays, put up an extension campus of Partido State University in Tigaon, and constructed a 44 million-peso grains center in line with the town’s objective of becoming the Partido area’s agri-business sector. A graduate of University of the Philippines Diliman, Fuentebella said he is determined to slug it out with political newbie Migz Villafuerte to raise the condition of the province from its present sorry state. Gov. Migz is the son of former Gov. LRay F. Villafuerte and grandson of former Gov. and Rep. Luis R. Villafuerte. Migz, however, does not enjoy the support of LRV, who is on the side of Fuentebella. Fuentebella’s running mate, meanwhile is Atty. Remelisa “Peachy” Alfelor-Moraleda, current president of University of Northeastern Philippines (UNEP) in Iriga City. She is also Integrated Bar of the Philippines Camarines Sur Chapter President, and daughter of former 5th District Rep. Felix “Nancing” Alfelor, Jr.
Also a graduate of UP Diliman, Alfelor-Moraleda worked to elevate the standards of the legal profession and improve the administration of justice in Camarines Sur. Alfelor-Moraleda will contend with Vice Gov. Fortunato Pena, who is running for his last term. The Fuentebella-Alfelor tandem also enjoys the support of Camarines Sur 1st District Rep. and Nationalist People’s Coalition (NPC) Provincial Chairman Rolando “Nonoy” Andaya, Jr., along with many local leaders.